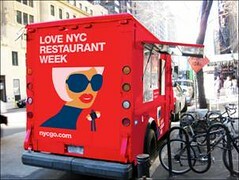 The 2010 Winter Restaurant Week kicks off on Monday, and as we reported a few weeks ago they’ll be promoting the two week event by sending a food truck out to sell soups from some of the participating restaurants. They announced the truck’s schedule today and it looks like it will be parked in Midtown (on Broadway btw. 51+52nd) from January 25th through the 29th. The truck will feature two to three soups a day, and may include “lobster bisque from Blue Water Grill, roasted butternut squash soup from Charlie Palmer’s Metrazur, Mexhattan clam chowder from Dos Caminos Park, tomato and fennel soup from Tribeca Grill and coconut and galangal soup with organic chicken and straw mushrooms from Kittichai. Each serving will cost $6 and come with bread from Tom Cat Bakery.” Plus they will donate $1 from every soup sold to the Haiti Relief Fund at the Mayor’s Fund to Advance New York City. Following the first week in Midtown, the truck will be parked in the Flatiron District Feb 1-3rd (on 5th Ave. btw. 18+19th) and in Tribeca on Feb. 4-5 (on Greenwich btw. Warren+Murray). Posted by Zach Brooks at 11:00 am, January 21st, 2010 under Restaurant Week. did they need a permit for this?